People have watched the night skies for millions of years. Some just out of curiosity. Some out of boredom. Some looking for portents, either good or bad. 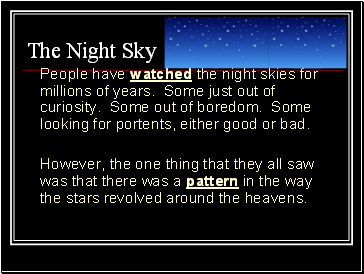 However, the one thing that they all saw was that there was a pattern in the way the stars revolved around the heavens. You need only to look up for a few hours to begin to see these same patterns yourself. Like the Sun, stars rise in the east and set later in the west. 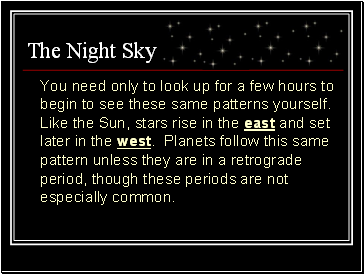 Planets follow this same pattern unless they are in a retrograde period, though these periods are not especially common. Complete darkness-Don’t laugh, it’s not that easy to find. Rural area are slowly being urbanized, bringing their lights with them. 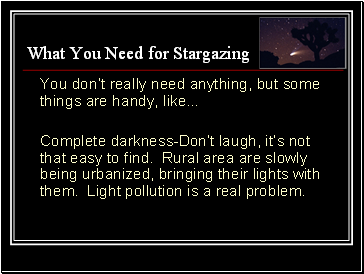 Light pollution is a real problem. Darkness means getting away from the city when you can. Stay away from any place that emits light in any way. 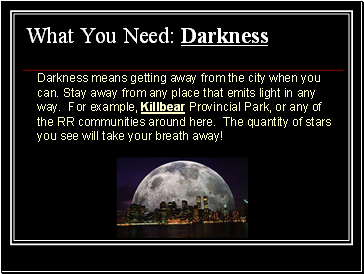 For example, Killbear Provincial Park, or any of the RR communities around here. 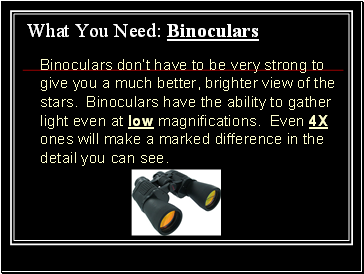 The quantity of stars you see will take your breath away! 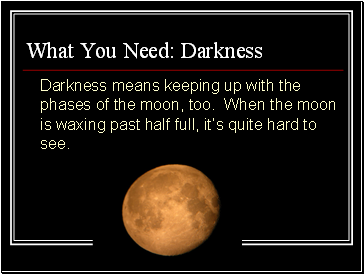 Darkness means keeping up with the phases of the moon, too. When the moon is waxing past half full, it’s quite hard to see. 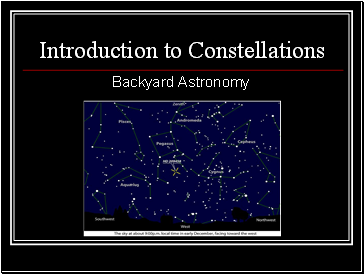 It is handy to have a star map to help get you oriented. 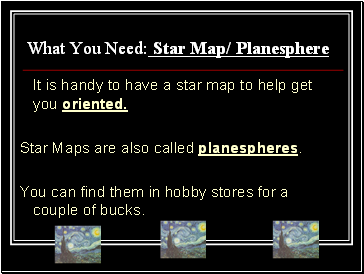 Star Maps are also called planespheres. You can find them in hobby stores for a couple of bucks. Well, you don’t have to trip around in the dark. You can bring a flashlight! There’s one problem here though. It takes your eyes about 20-30 minutes to get acclimated to the dark. 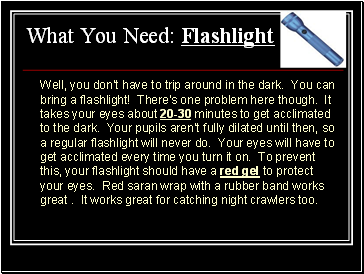 Your pupils aren’t fully dilated until then, so a regular flashlight will never do. Your eyes will have to get acclimated every time you turn it on. To prevent this, your flashlight should have a red gel to protect your eyes. Red saran wrap with a rubber band works great . It works great for catching night crawlers too. Getting Oriented or Where the Hell is North?